A few months back, Geoff and I got some hands on time with Evolve. It made us happy and excited for the game. Now, I’ve gotten to play more, and I can officially tell the naysayers – there is nothing boring or repetitive about this gameplay. Thanks to some awesome bookings and an even more awesome after hours Xbox event, I got some serious hands on time with Evolve. Of the five new playable spots on show, I managed to snag time with three, and here are some impressions. During our hands-on time when it was still warm enough for Geoff to feel his hands, we had a rather difficult hunter available for play. This time around, the hunter was way easier – Maggie is the perfect beginner’s hunter, and you will fall in love with her pet. Daisy is her monster-hunting companion, running off into the bushes to find it, even following the trail through water or other environmental obstructions. Rather than requiring the sound traps or other tracking tools that Griffin sported, Maggie can just stick with Daisy and track down the monster. Daisy can even revive teammates. She’s not just following her pet, though. Maggie is also responsible for throwing down the mobile arena, trapping the monster inside a dome and ensuring that the team can deal a ton of damage. She also comes with harpoon traps to slow or trap the monster, as well as a machine pistol to help deal damage. I found Maggie to be a way more user-friendly trapper. She’s not quite as powerful as Griffin was, but she makes finding the monster a much easier experience. Besides, who doesn’t want to have a pet in a game? As the name implies, Lazarus can bring people back from the dead. Combine this with his cloaking ability, and Lazarus can help keep the whole team alive, even if the monster thinks they’re all done for. He has a sniper rifle as well, which means that he can hide out far away, shooting at the monster and only venturing out (under cloak) to rescue fallen comrades. Of course, he can also heal – using an area of effect heal, Lazarus can help the team out before they become incapacitated, too. Lazarus is a very fun and active medic to play. It was a nice relief to not be constantly healing the entire team. Instead, I could shoot the monster and use map awareness to occasionally heal my nearby comrades. The cloak and revive ability is an absolute, um, lifesaver and the different type of medic totally mixes up the gameplay. Unlike the King Kong-esque brutality of Goliath, the Kraken is a completely different monster. Of course he’s still huge and powerful, but he is also able to fly, changing the type of movement and impression of this great beast. While the general objective is the same (eat enough stuff to evolve to level three and then take out the generator), nothing else feels the same about the monster. The Kraken’s abilities include lighting bolts, mines that seek out players, a short-range area of attack shock wave and a vortex shot. He feels powerful and confident, able to pick off potential food and even the hunters from a distance. The Goliath was like a giant, melee tank; the Kraken is an enormous rogue – keeping a distance and hiding in the shadows until the time is right. This time around, we played on a new map. Considering that thus far I have only seen two monsters, eight hunters and two maps, this game still has a ton to offer to keep players interested and excited. Each new variable can completely change the experience – this party would feel completely different if any hunter was swapped out for one of the hunters we saw before. The game is still so well balanced, but this isn’t done as a sacrifice to variety or choice. Despite not typically choosing to play FPS or multiplayer games, I simply couldn’t drag myself away from this game. If I could have, I would have played it all night. It is fun and each match is a completely new experience. It does have a steep learning curve initially, but once you get the hang of the different classes (and the monster), it is truly a blast to play. 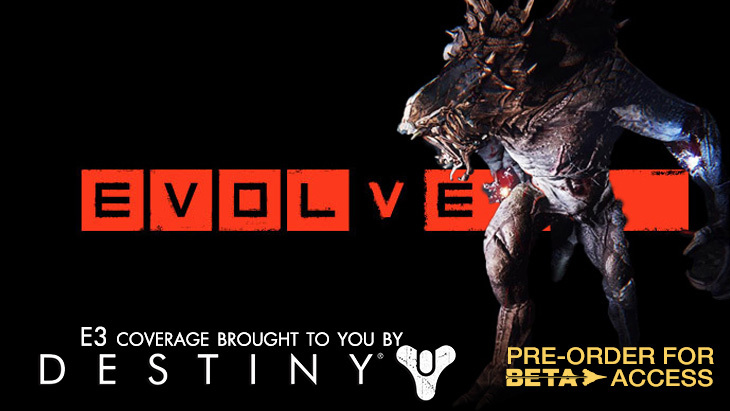 I’m saying this upfront – I will be buying this game at launch and I expect the community to do the same so that we can all get in on the awesome multiplayer experience.